I don’t think I’ve ever heard anyone use that word, “synchronized,” to describe that experience, and I find it really lovely. I also think that Hagio evokes that synchronization with increasing facility over the 40-year span represented in this collection. I mean, she has that knack from her earliest stories, but she just gets better at it until she doesn’t even need words to pull it off. It’s just breathtaking. You can view some pages over at Amazon, but I hope Fantagraphics post some other samples for preview, because I honestly think seeing anything from the book’s midway point on would convince someone to buy it. Reading Kate (The Manga Critic) Dacey’s review will also go a long way towards that. Huge thanks to Deb (About.Com) Aoki to take time out of her insane Comic Con International schedule to pick up a (signed!) copy for me. I owe her forever. This entry was posted on Monday, August 9th, 2010 at 5:45 am and is filed under Fantagraphics, Quick Comic Comments. You can follow any responses to this entry through the RSS 2.0 feed. Both comments and pings are currently closed. Hearing all these advance reviews is immensely gratifying and extremely agravating, since I KNOW these stories are really good, but it won’t be out until the end of September for the rest of us. As such, I can’t read these reviews too heavily for fear of spoilers (I avoid movie reviews for similar reasons – I want to be surprised by what I’ve seen) and have to keep these on the backlog until I’ve got the product in question. Be sure to reference this post when her book finally comes out. Yeah, I basically will be getting this book for, like, everyone I know for Christmas. I am really, really looking forward to Wandering Son now, too. I’ve literally been waiting for this book ever since I was 15 and picked up A A` and Four Shojo Stories–so nearly 15 years ago. Things like Vertical’s Takemiya volumes (and their tweet last Fall about maybe picking up some more classic shoujo), and the 2005 Comics Journal on her, kept me hopeful, but… Truly, no manga has ever interested me as much as the works of the “49ers” (and even earlier manga-ka as my dog-eared Japanese bunkos of Hideko’s Fire! will attest to, despite being able to read next to known of it)–but Moto Hagio, especially. Anyway, I really hope this leads to more–but it’s sounds like a brilliant volume for both longterm fans, and to introduce the woman’s amazing work. One thing that did make my heart sink–I just checked the amazon.com listing where I pre-ordered the title from, and saw the release date now says Sep 27, instead of Sep 7. I’m really not sure I can wait more than a month! I did find myself wondering about the relative lack of boys’-love content. Much as I want to read examples from that category of Hagio’s work, I didn’t find the collection lacking in any way, because the stories there are beautiful and they represent what I’ve thought of as Hagio’s essential qualities as a storyteller — psychological acuity, emotional punch, and visual beauty. Still, the absence of BL work does kind of make a promise, doesn’t it? 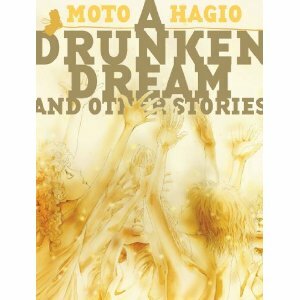 Because you can’t ultimately celebrate Hagio’s career without publishing significant works from that category. It’s true that, November Gymnasium aside, most of Hagio’s BL work that’s well known are from her longer (in the case of Zankokuna Kami ga Shihai suru,*longest*) works. But I agree with you–surely knowing Matt Thorn’s love for Heart of Thomas (a love I share, probably more than the love for his other favorite work, the interesting but biazarre Banana Bread Pudding), I hope it’s soon int he pipeline. Having the TCJ issue #269 Shojo manga, the “Synchronicity” is mentioned in very beginning of the Moto Hagio interview introduction. Since reading “Hanshin”, i’m in synch with this author. Just wanted to point out that, while amazon seems to still not be releasing this for a month or so, you can order it right now direct from Fantagraphics books. And whilesupplies last they’re including free signed copies.